Today is Dr. Seuss’ birthday and I want to start off by celebrating someone who made such an impact on the world. He’s left a legacy that will be remembered for years. As kids most of us read his books and I believe they will stand the test of time and last for generations to come. Now, those of you who have kids and have read his books to your own kids might have noticed the underlying messages in his books. There are several about ethics, how we treat people, persistence, etc. It’s pretty sneaky how he got all those in those simple little books. There is one lesson that I learned later on in life. I have to give full credit of this to my first Internet Marketing mentor Armand Morin as he’s the one who taught me about the lesson in this book. I’ve been able to share it with 100s of other entrepreneurs and now I want to share it with you. There’s a couple of underlying stories going on with the book. First off, it’s about being open to new things and not discounting them because you “think” you don’t like them. Great for kids who won’t eat their veggies, right? Well, there’s one more lesson I think each and everyone of us needs to learn…ESPECIALLY Entrepreneurs! How to KEEP asking for the sale. How often do we ask for the sale and when someone says no we give up. Maybe we move on to the next person. In this book our waiter asks no less than 20 times! Now, I know that in real life that would be annoying but in the end, Sam gets our guest to try the eggs & ham and he loves it. He’s persistent in asking for the sale. He’s not willing to give up. In real life we need to ask for the sale WAY more than we usually do. I’m as guilty as anyone on this one but I’m always striving to be better. We never know when someone will be ready to buy. Now, you don’t have to be as annoying as Sam is in the book. Asking someone 20+ times in a five minute time frame is a bit overboard but don’t think that someone saying they aren’t interested right now is a reason to write them off and never keep in touch with them. You’ve got to nurture them for the long term. We’ve got to remember, people buy when THEY are ready to buy, not when we want them to. That doesn’t mean we give up when they say no. It means “not right now” and we need to educate them to keep top of mind with them. Like Sam, your job is to help someone make a decision that is in their best interest. 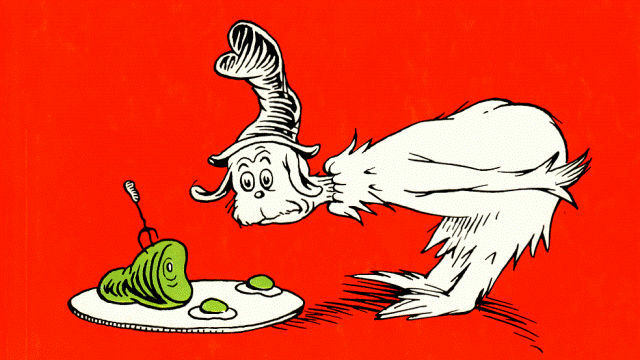 If he had just given up, our happy guest would never have tried the green eggs & ham and never known he actually loved them. Don’t give up. When you meet someone you know you can help, it’s your job to keep in touch and remind them that you’re there for them. Don’t LET them forget about you. Make sure there’s no doubt in their heads that you are the right person for the job! Don’t ever give up on asking for the sale and remember you might just be giving someone an experience that will change their life for the better. Thank you Dr. Seuss for a lesson that all of us need.